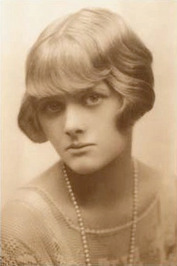 Daphne Du Maurier (1907- 1989) was a big inspiration to Alfred Hitchcock, and he made a movie based on this story as well as on The Birds, which she also wrote. That alone should let you know what kind of beautiful dark mind Daphne Du Maurier had in her writing. I put the movie on order from Netflix, and I’m waiting for it with much anticipation! I discovered the book under suggestions for Gothic Romances similar to Jane Eyre, by Charolette Bronte, which is one of my all-time favorite books, and Dracula, by Bram Stoker, which I also love! This book was a delightful read on every page, and I adored the way she described the setting and gardens in such detail. I could almost smell the flowers, hear the sea, and feel the air as she saw it in her mind’s eye! I didn’t realize how haunting and very creepy the story is until about half way through the book. I almost became comfortable that I was reading a safe, normal romantic story, which allowed the eeriness of it all to get to me much deeper when it did pop up from time to time, and near the end I was completely shocked with the turn of events. It made the sobbing I went through for the poor heroine totally worth it and much easier to swallow. I had been afraid that she might be another author willing to leave the audience unfulfilled like has become common lately in a lazy way to avoid making a story predictable, but I was so glad to be wrong about it. I can’t really say if I thought the ending happy or sad, really, and I supposed you’ll just have to read it for yourself to make a decision. It truly is a Gothic Horror type of experience as everyone was claiming on listopia. If you’re a fan of those, then it is worth it to browse the list I went by to pick my next reads in the genre. Next I’m going to be reading another book from that list: The Monk, by Matthew Gregory Lewis, and then I’ll go to Carmilla, by Joseph Sheridan Le Fanu. I’ve had luck with this Gothic Horror list so far, so perhaps these will become new favorites to me as well!